I guess before starting my review on Raanjhanaa I should mention that Prabh and I just LOVE bollywood, or the correct term would be Indian Cinema. Therefore you might be seeing lots of talk here on the blog related to bollywood! Now onto Raanjhanna. I have mixed feelings about this one. 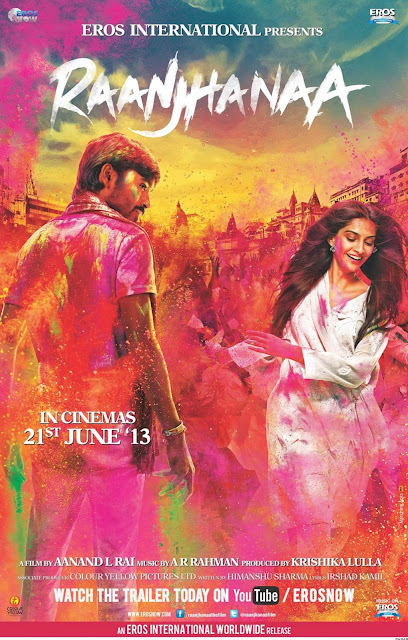 What I liked: the amazing acting by the two leads Sonam Kapoor (another one of my favs) and newcomer to bollywood Danush. Danush was amazing for his bollywood debut, and Sonam Kapoor proved to any doubters that this girl can ACT! I definitely liked the first half of the movie more than the second half. What I didn't like: What I didn't like was the portrayal of the female character (sonam kapoor) vs the male character (danush). The male lead is almost stalkerish, does makes some big mistakes with big consequences, but in the end of the movie he is the hero of the film who sacrifices everything for love. Whereas the female lead is portrayed as selfish, cruel and weak. It was an alright movie, entertaining and funny at times.